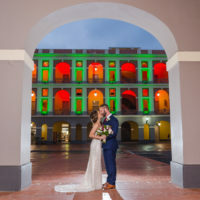 Amanda & Tim contacted me a weeks before their trip to Puerto Rico to inquire about my wedding photography. They told me they weren’t too fond of traditional photography, get married, have fun, and have someone there to capture those memories. I automatically jumped in, since I love offbeat, laid-back weddings! On their wedding day I drove to Fajardo, Puerto Rico, where they had rented a penthouse where they would get ready. I met their two friends who also had traveled for the occasion, one of them who also was going to be the ceremony officiant. After a short and sweet first look at the upper terrace, we packed the cooler, flowers, and drove to the Seven Seas beach, a beautiful and accesible beach. I was excited because Amanda and Tim asked me to choose the exact spot where we would set camp (when do I ever get a say in that?!). We put flower petals in the sand, and the ceremony started! After the vow exchange and the kiss, Tim popped-open a champaigne bottle, we had a funny toast, and did a couple of portraits. Since the day was too hot and bright, we decided to walk to a nearby kiosk to cool down while we waited the sun to go down a bit more. After a couple of beers, we took a walk through the beach, all the while I was taking photos. It was beautiful hanging out with you guys in such a beautiful afternoon, and I hope to see you back again in PR! I wish you a long, healthy life together full of laughs and fun.